The S.C. Department of Natural Resources will sponsor youth deer hunts in the Piedmont region this fall. Participants will be required to complete a short training course on gun safety and go to the rifle range and fire the gun they will be using during the hunt. The S.C. Department of Natural Resources, in cooperation with a number of private individuals and hunting clubs, is sponsoring a number of youth deer hunts in the Piedmont region this fall. The hunts are for youth between the ages of 10 to 16 who would like to go deer hunting but don't have anyone to take them. All hunts will be carefully supervised and participants will be given instructions how to hunt effectively, safely and ethically. These events will be a part of the S.C. Department of Natural Resources (DNR) Take One Make One program (www.dnr.sc.gov/education/tomo/index.html). No costs are associated with these special hunts, but parents or a guardian must provide written permission for their youngster to attend and must sign a liability wavier form and provide transportation to and from the event. Young sportsmen and sportswomen who think they might like to attend one of these special youth deer hunts this fall are encouraged to write or call for an application today. The deadline for returning applications is Monday, Sept. 12. Applications are available from: Union DNR Office, 124 Wildlife Drive, Union, S C 29379, telephone (864) 427-5140; DNR Columbia Office, PO Box 167, Columbia, SC 29202; telephone (803) 734-3886; or download an application from the DNR website at www.dnr.sc.gov/hunting/youthhunting/youthhuntingapp.html. "We are specifically looking for young people who have an interest in hunting but don't have anyone to take them," said Gerald Moore, DNR wildlife biologist based in Union. "These special hunts are designed for a growing number of youth today who don't have a parent, relative or close friend that hunts and can provide them proper exposure to the hunting experience. As a result, many of today's young people are missing out on a challenging and enjoyable recreational activity." Participants will be required to complete a short training course on gun safety and go to the rifle range and fire the gun they will be using during the hunt. Appropriate firearms will be provided for those who need them if a request is made on the application. 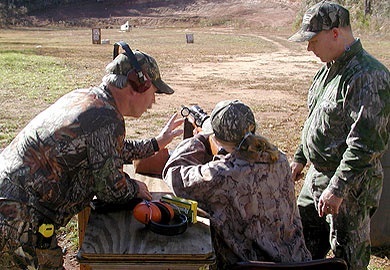 A parent or other adult must accompany each youngster at the rifle range and during all hunting activities. Lunch will be provided by ATDO Ministries prior to the hunt for all youth and their parents.